Photographs of the river cannot do full justice to the SDFFA fishery on the upper Salisbury Avon, as it covers over 6 miles of the river between the villages of Coombe and Bulford. However, it is at its very best both scenically and for fly-fishing in late May and early June when it experiences a prolific hatch of Mayfly, and when many of these photographs were taken. 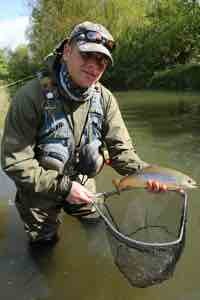 As the pictures show, the fishery has a remarkable diversity of river habitat, ranging from deep, slow sections (ideal for big grayling), through classic chalk stream glides with bars of flowering ranunculus, to the shallow riffles beloved of juvenile wild brown trout. But although it is a chalk stream in all respects, it is only 3 miles downstream from the entrance to Pewsey Vale at Upavon, and it therefore has had to bear the brunt of occasional severe winter floods as is also illustrated below. Over the past 20 years the fishery has been subjected to extensive restoration work, narrowing over-widened stretches, and introducing woody debris in order to improve flow rates, thereby improving conditions for fish and invertebrates, stimulating the growth of water crowfoot and confining silt deposition within specific areas. 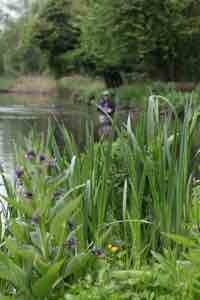 While a bank side path for anglers is maintained throughout the season, a wide margin of vegetation is allowed to grow unchecked in the interests of fly life, and in order to counter bank erosion.